Geology Strata above the Main Limestone. Record Name ELL04 Ellerton Moor. 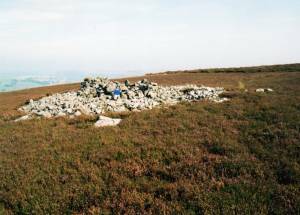 Large round cairn on Moor Edge. 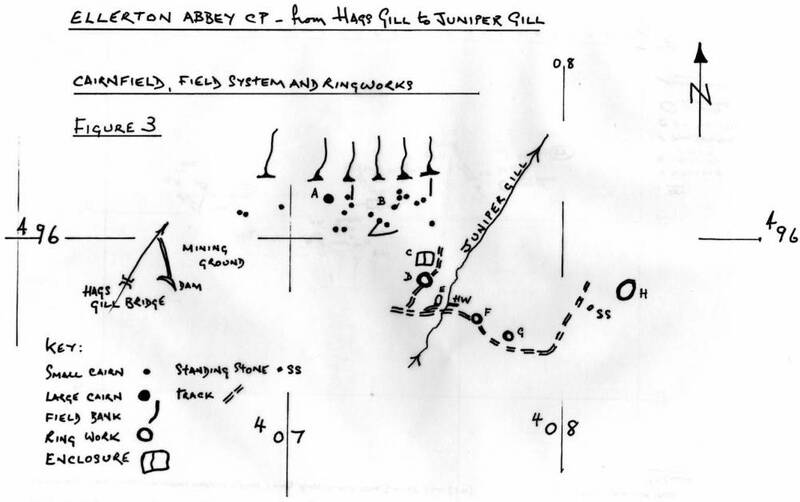 Record Description Cairn at A on Figure 3. Round cairn 10.5m diameter built with clearance stones and with three visible stone spurs at the perimeter. Reduced by quarrying and disturbed in the centre by the construction of a shelter. 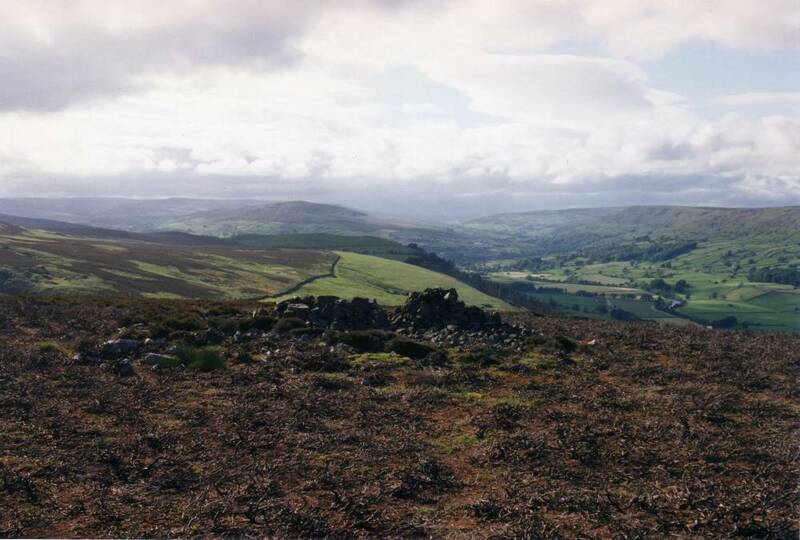 This cairn false crested at the point where Mickle Fell and The Pennine Escarpment overlooking The Vale of Eden is visible through Arkengarthdale and across the level plain of Stainmore Forest. This cairn marks the most direct and lowest track way of all Pennine crossings. Both Swaledale and Wensleydale lead nowhere and are in effect cul de sacs. NOTE! ARMY RANGE DANGER AREA! This site is on an active Army Firing Range. Access is NOT ALLOWED without express written permission from the Army Range Authorities. Additional Notes This is the largest stone cairn in a cairnfield of around 20 cairns with coaxial field boundaries.(ELL05). Groups of small cairns with stone field banks or â€˜cairnfieldsâ€™are interpreted as of agricultural clearance origin. 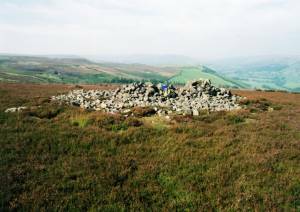 However the cairns may also serve as burial monuments, as at Crawley Edge above Stanhope where two cairns of a similar cairnfield were excavated and one found to contain a cremation in a collared urn of early Bronze Age type (Young 1992). 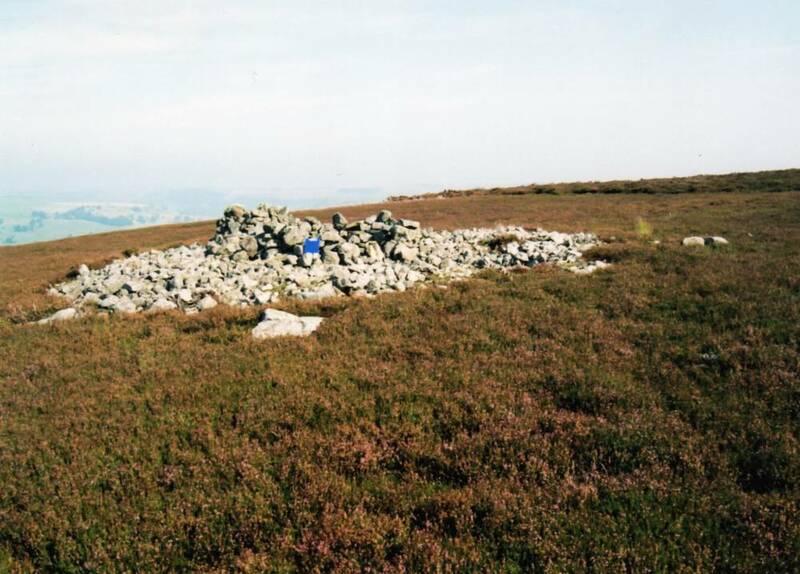 This round cairn is large for the area and was constructed entirely of field clearnce stones as are the small cairns and field banks which are masked by thick heather on the high moorland spur to the west of Juniper Gill. Round cairns are always constructed from clearance stones and small rocks collected from the surrounding area. 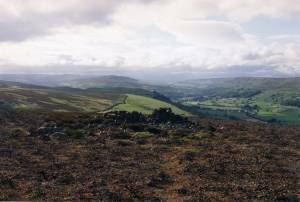 There are no definite examples of earthen barrows in Swaledale. Most small barrowlike mounds are small drumlins of glacial origine. Image 1 Description The round cairn and view north west through Arkengarthdale. Image 2 Description Location Plan. 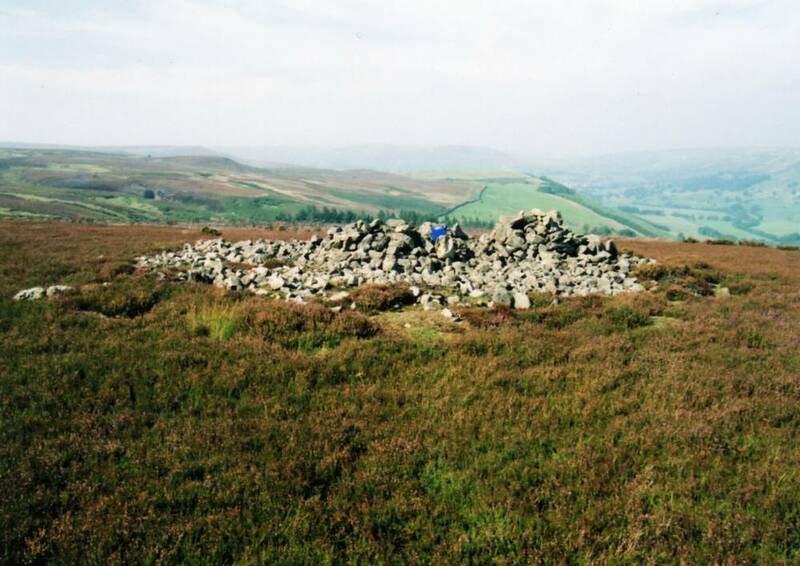 Round cairn, cairnfield and field system west of Juniper Gill. Image 4 Description The round cairn. 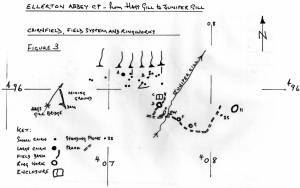 Note short radial spurs, these spurs are fairly commmon features on prehistoric cairns in the Pennines. Image 5 Description As last. Different view.